When born, green sea turtles are only 5 cm (2 in) long. But they grow up to 1.5 meters (5 ft) in length and can weigh over 300 kg (700 lbs), making them the largest of the hardshell sea turtles. The dorsal shell of the green turtle, or carapace, is wide, smooth, and brownish-olive in color. The underside of the shell, or plastron, is yellow. Green sea turtles are so named for the greenish hue of their skin. They have heads that cannot retract into their bodies, a trait commonly associated with turtles. Reaching speeds of up to 56 km/h (35 mph), their streamlined shell and paddle-like flippers aid in their ability to swim quickly and with grace. Green sea turtles are able to hold their breath for hours at a time. Because they are cold-blooded, the temperature of the water affects their ability to hold their breath. In colder water they can hold their breath for longer. With features well-adapted to sea life, their agile mobility underwater does not carry over to their travels on the beach. On land they move slowly, laboriously pulling themselves along with their flippers. But in general, green turtles only venture onto land to lay their eggs. Females lay eggs every 2-4 years once they are sexually mature. To reach their nesting grounds, green turtles migrate long distances, traveling back to the beaches where they were born. After mating in the shallow waters near shore, female turtles climb onto the beach and lay their eggs in a pit. They lay 100-200 eggs at a time and leave them alone for 2 months before they hatch. 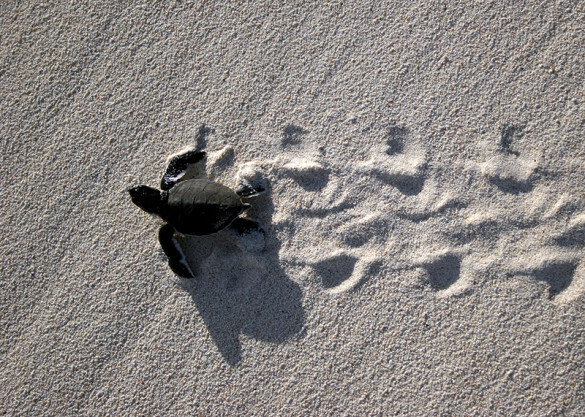 Once the baby turtles hatch, they must crawl to the water and avoid a multitude of predators, including birds and crabs. Photo by Mark Sullivan, NOAA affiliate. 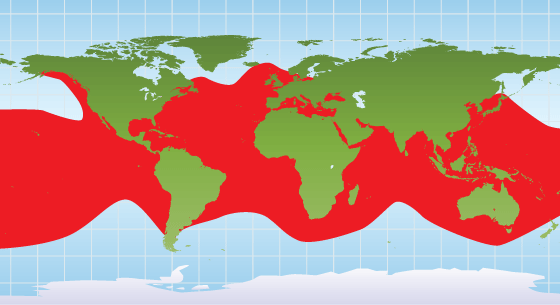 Green sea turtles make their home in tropical and subtropical oceans worldwide. There are two types of green turtles, the Atlantic green turtle and the Eastern Pacific green turtle. It is debated whether these are subspecies or completely separate species. Each of the populations has its own feeding and breeding grounds. Atlantic green turtles are found throughout the Atlantic Ocean, while Eastern Pacific green turtles are found in the Indian Ocean, Pacific Ocean, and Mediterranean and Black Seas. Over 80 countries in the world have green turtles nest on their beaches. 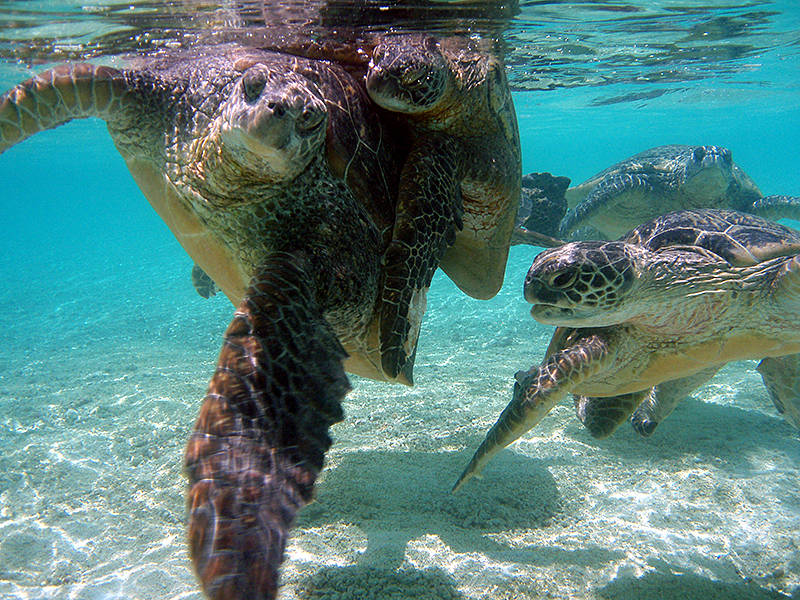 Green sea turtles feed on crabs, jellyfish, and other creatures as juveniles. As adults they become herbivores, primarily eating sea grasses and algae. According to the IUCN, green turtles are listed as endangered, and their numbers are decreasing. Green turtles are hunted and their eggs are collected by humans, a legal practice in some countries. 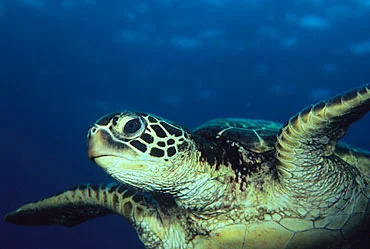 Green turtles are also threatened by destruction of nesting areas and foraging areas in the sea. Sometimes green turtles are accidentally caught in fishing nets, further declining their population. There are efforts to lessen the amount of turtles and eggs harvested in many countries. In addition, many countries are trying to protect the nesting and foraging grounds. They are protected under many treaties and laws. Green sea turtles can use as many advocates as they can get. 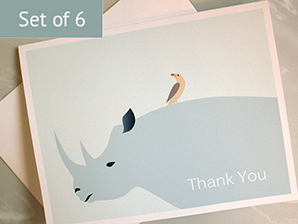 Make sure you do not purchase products made from this endangered species. Also, if you live an area that green turtles use for nesting, you can lead a community effort to protect the beaches they nest on.